Andrew Minturn is strategic product manager at Bosch Rexroth AG, Lohr am Main, Germany; www.boschrexroth.com/en/xc/. Status charts, annotation notes and to-do lists displayed via an interactive touchscreen display, deliver digestible insights into how well the factory operates. A company’s ability to adapt to market trends, a crucial capability in remaining competitive, continues to grow in importance, as consumers expect customized products, greater flexibility and shorter lead times. To meet these demands and overcome ever-present challenges such as increased cost pressures and heightened quality standards, facility managers must understand how plants can improve to support modern manufacturing. In practice, that means making changes to existing equipment, streamlining processes and adopting new technologies to realize greater levels of efficiency, improved productivity and, ultimately, enhanced competitiveness. The most influential trend within the sector right now is Industry 4.0—the updating of plants and machinery to create digitiized smart factories, allowing manufacturers to be more flexible and, in turn, better able to meet market demands. In practice, through the Internet of Things (IoT), everything connects, from machinery through to the supply chain, placing data firmly at the heart of the modern factory. With every element of a facility—including legacy machines—potentially capturing data, processes can be optimized more effectively. Sensors fitted onto all types of machinery allows for data gathering in real time, delivering a host of process-monitoring benefits, from the ability to conduct production quality checks at the point of manufacture, to system health checks and continuous monitoring. To make the most of this data and enable the process of continuous improvement, manufacturing plants must be able to process data immediately. Digital solutions make it simple to collect, process and visualize relevant data. The equipment presents vital performance figures and statistics in real time. One example: Bosch Rexroth’s Active Cockpit. Harnessed directly from sensor-fitted equipment, complex raw data translated into status charts, annotation notes and to-do lists, displayed via an interactive touchscreen display, deliver digestible insight into how the factory operates. This allowsfor more accurate decision making on the shop floor as well as rapid reaction with minimal effort. Production lines can maintain their flexibility and continue to run efficiently, with small changes made as soon as the data identifies a need. With this knowledge, facility managers can ensure the smart operation of their factories, with targeted process monitoring taking place continuously. Faults can be identified earlier, leading to fewer equipment failures and reduced downtime. While key to facilitating data collection process monitoring, sensors also can bring legacy equipment into the digital future of manufacturing. Even machines that don’t appear to lend themselves to an Industry 4.0 environment can be brought in line with the needs of a smart factory. Fitted onto a machine or tool cell, sensors remain at the heart of smart factories. Connected to software that measure key variables such as temperature, pressure, vibration and power consumption, they give machines a voice and allow engineers to understand the real-time performance of keymachinery. Armed with these insights, facilities managers can control and optimize machines and processes. Harnessing and relaying performance figures to central solutions such as ActiveCockpit, smart sensors also can respond to control commands, receiving new settings in seconds to maximize flexibility, and enabling actions such as rapid product changeovers. Industry 4.0-equipped factories can create a progressively smarter future, one where virtual reality plays a critical role in the manufacturing process. Imagine a workspace tailored specifically to the shift worker, with assembly instructions automatically displayed in the operator’s language, able to select tasks according to the operator’s qualifications and with adjustable features, such as font size and workstation height. 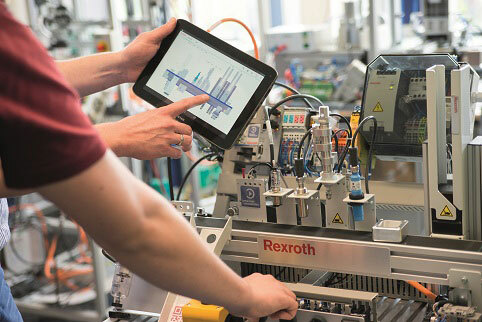 Taking the smart workstation even further, products such as Bosch Rexroth’s ActiveAssist utilizes RFID tags to identify workpieces produced, prompting the operator to assemble pieces in the most effective order using an interactive display. Further reducing the potential for human error, pick-to-light systems indicate components needed next, immediately alerting the operator to any mistakes. The result: new levels of production reliability and transparency, as each stage is monitored and data accurately harnessed, so that every product has complete traceability. These scenarios aren’t decades down the line. They can be realized today by any manufacturer embracing and practicing connectivity.